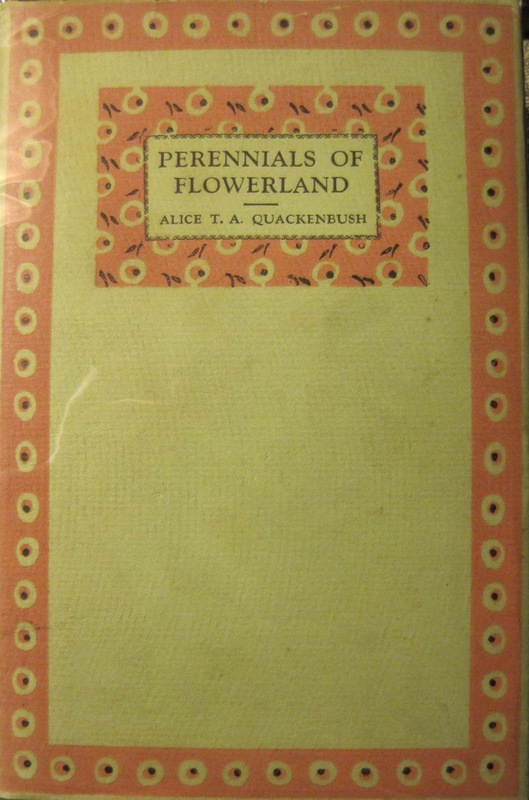 Wanted: Information on the garden writer Alice T. A. Quackenbush. Born in either 1879, 1880, or 1881 in New York. Husband's name was likely Walter Quackenbush. May have lived in Westport, Connecticut in the 1930's where she had a radio show about gardening. Wrote many gardening related articles including some published in The Garden Magazine and Home Builder and The Gardeners' Chronicle. Wrote three books: All in a Garden Fair (A. T. De La Mare Company, Inc, 1925), The Annuals of Flowerland (The Macmillan Company, 1927), and Perennials of Flowerland (The Macmillan Company, 1929). I would love to know more about Alice, if anyone has any information at all. Most useful would be her maiden name and the date she died. "The royal road to happiness passes through the garden, in fact, may begin and end there. For to garden successfully is achievement of the finest. Its sturdy requirement can lure youth from less admirable pursuit; its benign serenity makes point to age that usefulness increases with the passing years. Call it tonic, sport, science, art, if you will. But do not fail to call it, adventure." You'll get no argument from me. Gardening is an adventure, and so is reading old gardening books. Old gardening books have the power to transport us back to another time. They can remind us of plants long forgotten and help us see old plants in new ways. The authors can be sweet and sugary or pompous and pontificating. They can lead us in directions we never imagined and take us along on adventures we never anticipated. I now have all three books Alice wrote and would love to know more about her. Carol - In the 1930 census she is in Redding Town, Fairfield, CT a boarder - listed as a married and a writer to garden magazines. Thank you, Beth. I appreciate your research! Email the local Connecticut libraries and see if they have any info in their local history section.